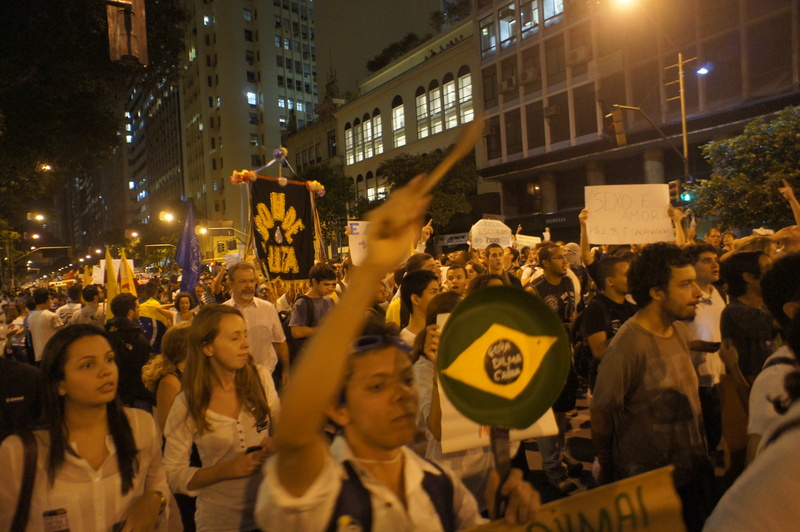 The demonstrations, across Brazil and even carried out by Brazilians abroad, are really about inequality and injustice — the foundations of corruption and impunity. The parrot José –a puppet sidekick– said almost nothing for the first hour of Ana Maria Braga’s TV Globo morning show, Mais Você, today. Braga, who usually treats her viewers to recipes, health, beauty and personal growth, declared that yesterday’s protests would go down in Brazilian history. “It’s legitimate to want a more just society,” she concluded. For decades, the lower classes have suffered inhuman commutes to their jobs. 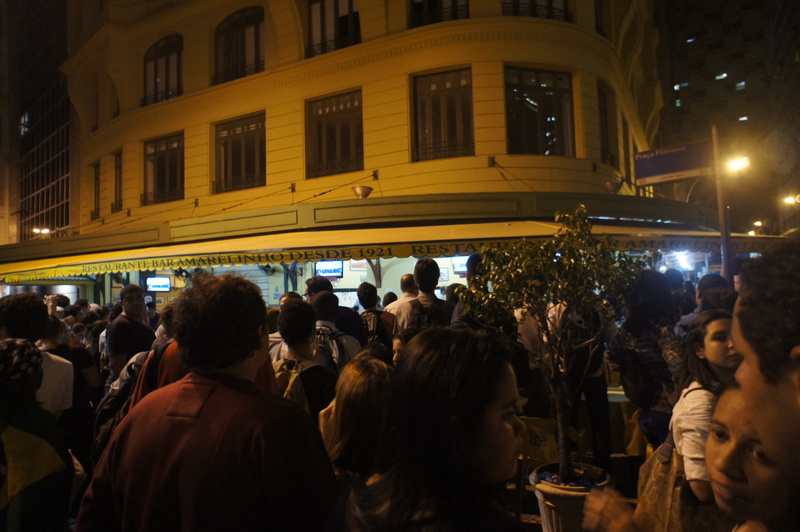 The twenty-cent bus fare hike in Rio de Janeiro and São Paulo (which sparked initial protests) is part of a larger, oppressive public transportation issue, which in turn represents a larger oppressive political and social structure. Lack of public- and private-sector transparency, accountability and dialogue are key parts of the story. For example, the Rio bus companies haven’t made public their real costs, so citizens can’t judge for themselves whether the fare hike is just. A recent Globo newspaper story noted that they haven’t complied with concession requirements. Brazilians blame their elected officials. 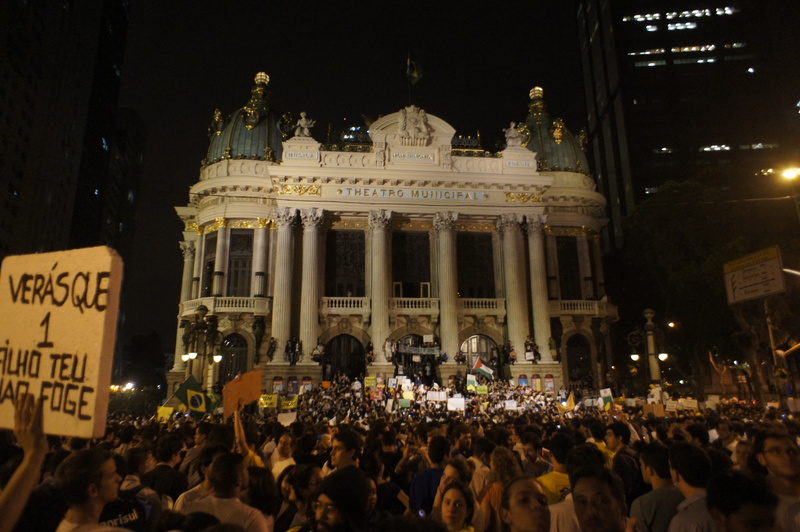 Whoever carried out the violent attack last night on the Rio State Legislature building — a small group, compared to the 100,000 who peacefully filled Avenida Rio Branco — notably did not choose the Municipal Theater, the National Library, or the National Fine Arts Museum, all nearby. Sadly, their vandalism did spill over onto the colonial-era Paço Imperial and some nearby shops and cars; some also battled with police, who used firearms. 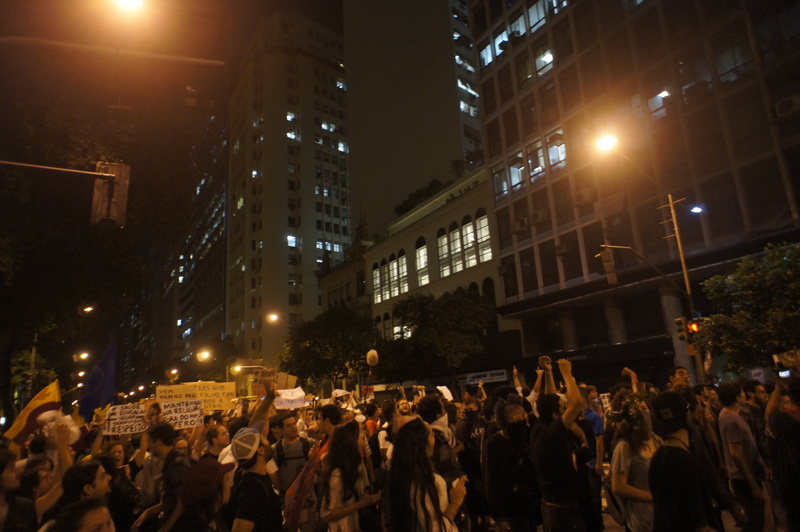 In São Paulo, a small group also tried to attack the governor’s Bandeirantes Palace. 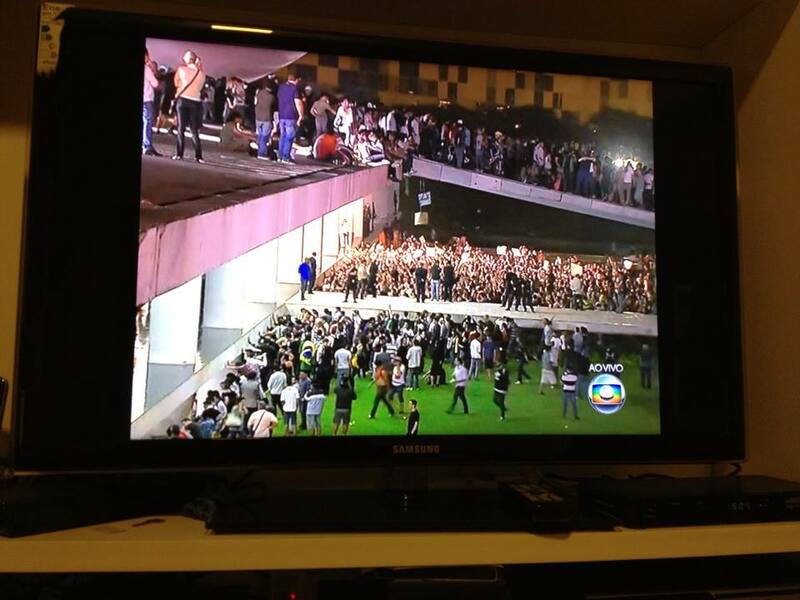 TV Globo, which last week gave initial protests short shrift and is so reviled by protesters that its reporters last night used unmarked microphones, has gotten on the bandwagon. Even the women’s program that follows Braga’s focused on the demonstrations, providing analysis. And when Globo gets on the bandwagon, it goes places — even if no one has a clear idea of the wagon’s itinerary. 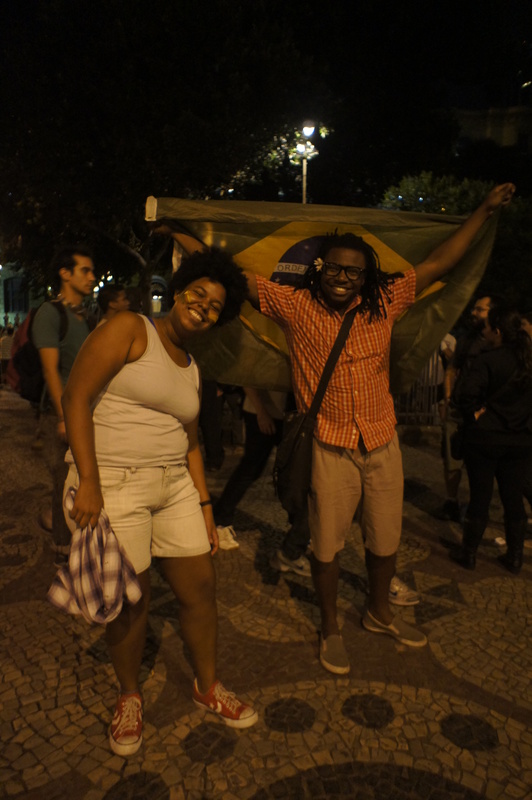 The protests in Brazil are occurring –more are planned later this week, with calls for a general strike July 1 — as the Confederations Cup (a FIFA soccer championship that precedes the 2014 World Cup, which also takes place in Brazil) gets under way, in six cities. Brazilians cheered across the nation when Rio de Janeiro won the chance to hold the 2016 Olympics. But now, as their tax money pours into overpriced mega-event infrastructure (and, many say, the pockets of politicians and other middlemen), they’re waking up to what those same funds could do in the long-neglected areas of education, health, public safety and transportation. The internet has helped spread information and create networks. Brazilian twenty-somethings seem akin to American baby boomers. Many, unlike their jaded forebears, are idealists, and believe in their capacity to change the country. Leaders of the Movimento Passe Livre, on last night’s Roda Viva TV program, were impressively articulate and convincing about their reasons for demanding free bus fare and for organizing what has become a national movement. The mega-events crown a decade or so of social and economic change, with millions leaving poverty and joining the formal economy. Rio’s favelas, for example, have seen a significant real increase in income. Universities, both public and private, have accepted a growing number of low-income students. Unemployment is at record lows. Brazil’s poor have long pressured for social and economic inclusion. The 1964 coup, carried out in the context of the Cuban Revolution, was meant to keep the lid on such pressure. Technocrats, during the 1964-85 military government, said that economic gains would trickle down, and some did. But huge gaps persisted. Once hyperinflation (created by the dictatorship) was tamed in 1994, the minimum wage saw real increases and income transfer programs could be expanded. Under President Lula, the lid at last came off — and cannot be put back on. For a country whose political and social structures were basically built on a two-tier system of justice, education, transportation and health care, the challenges are now enormous. Some signs are heartening. Yesterday, when movement leaders met with São Paulo police to discuss their protest route, the state Military Police chief had a suggestion: “I’d like you to hold other demonstrations, for example, against impunity and for the imprisonment of the mensaleiros” (congressmen convicted for accepting monthly payments for their votes, but still at large). Click here to watch a fun video parody (with English subtitles) about the São Paulo protest last week. This entry was posted in Brazil, Transformation of Rio de Janeiro / Transformação do Rio de Janeiro and tagged Brazil street demonstrations, Rio de Janeiro protests, Rio protests. Bookmark the permalink. It is my view that perhaps two generations of Brasilians were basically taught not to expect anything from the future. As soon as they hoped, or planned for a future, it was wiped out by either inflation, corruption, criminals or other means. So, Brasilians became very adept at living in the moment, perhaps more so than any other people on Earth. Brasilians became known for that quality, and others have aspired to it. Now, Brasilians want and are demanding a future, and want to eliminate the roadblocks to the future which hold so many of them back. I saw a poster showing the R$0.20 bus fare hike as the tip of an iceberg, with all the other social and political issues just below the surface. That is exactly what this current social unrest and protesting is all about. For these protests to continue and succeed, there must be more focus on what can be accomplished, and away from criticizing what should have been done. 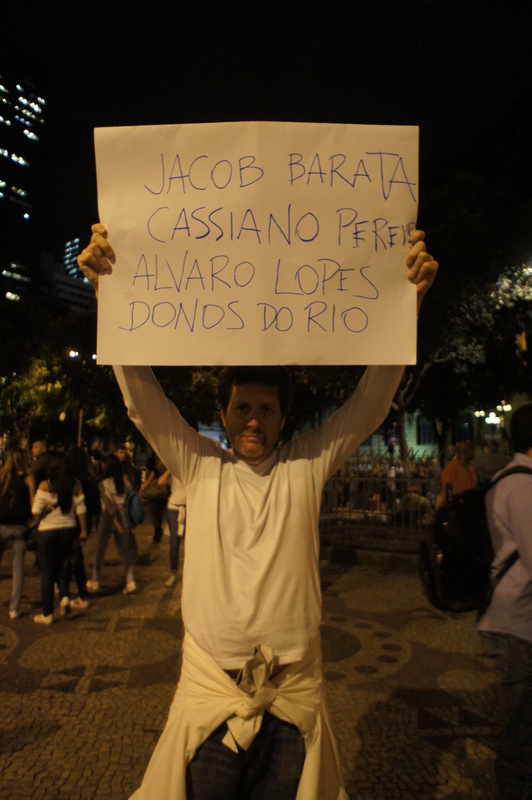 The stadiums and sport facilities for the Copa and Olympics are done deals, they cannot be erased at this point in time so why bother protesting them? Why not instead focus on how it was these decisions were made, and change the decision making process and the electoral process if necessary. Focus on accountability, not just for the bus lines (such as by requiring them to pay the fines they incur and by prosecuting bus drivers for the injuries and deaths they cause) but for all of government. Tie elected officials salaries to a multiple of the minimum wage, prohibit their hiring relatives to government jobs, or signing contracts with firms owned or operated by relatives. Require public officials to publish their tax returns and financial statements as a condition for public office. Make lying on those statements a felony level offense, with mandatory time in prison. Make government less attractive to thieves and the thieves will go elsewhere! Government in Brasil is like a mansion full of valuables but with no locks on the doors and no security system, of course it will be robbed. Personally, I doubt these protests will lead to anything. The current and immediate past Presidents of Brasil rose to power from the street up, organizing and participating in protest movements themselves, and much good has come from their administrations yet much of the corruption remains. Clearly, that corruption is deeply ingrained and will take a massive and sustained effort to be rid of it. Sustained being the key word. Are Brasilians up to the task? Or, is there a free music show on the beach or some other fun social event which requires putting off such serious discussion? Please don’t get me wrong, I love Brasil and Brasilians. Living in the moment can be a wonderful thing, until the alarm clock goes off. I am from the US but live here by choice. I call Rio the most perfectly imperfect City. But I do see and feel the frustration here, it is real and it requires attention. Quit trading votes for toasters, quit voting for illiterate clowns (though I always add, Tiririca has brought attention to the needs of education in Brasil and is honestly doing what he can on that subject) and devote a few hours each month to doing something on a personal level, big or small, to help. I tried to form a group to repair the Pedras Portuguesas in the sidewalks here in Rio. Guess what? I could not get a single Brasilian to devote one hour per month to helping repair the lovely but neglected and dangerous stone sidewalks of Copacabana so the elderly and mobility impaired could use them without fear of being injured. I have to assume protesting is just more fun.